– It has been developing uninterruptedly throughout the past eleven centuries, from 880 AD till present. – It the biggest castle complex in the world covering an area of 45 hectares. – You can admire ecclesiastical monuments, fortification, residential and office buildings representing all architectural styles and periods, surrounding three castle courtyards. – The dominant of the castle (and the city´s sky line) is the St. Vitus Cathedral. – Originally it used to be the residence of princes and kings of Bohemia, since 1918 it is the seat of the president. – Changing of the Guards at the Castle gates every hour starting at 6 a.m. – 11 p.m. (Winter), or 5 a.m. till midnight (Summer); at noon with fanfares and banner exchange. – The bridge is 515 meters long and 10 meters wide and connects the Old Town and Lesser town. – The oldest Prague bridge built in the place of the Judita’s Bridge that had been badly damaged by a flood in 1342. – The Stone or Prague Bridge since 1870 called Charles Bridge, was founded by Charles IV in the year 1357. – The bridge was built by Peter Parler and finished in 1402. – Both ends of the bridge are fortified by towers (the Lesser Town Bridge Towers, the Old Town Bridge Tower). – The entrance gate to the Charles Bridge Tower from the Old Town river bank. – The most beautiful gate of the Gothic Europe was a masterpiece of the Court Buildingworks. – It was built in the second half of the 14th century. – The Tower is richly adorned with sculptures: coats of arms of the countries belonging to the Czech Crown under the reign of Charles IV and statues of St. Vitus, Charles IV, Wenceslas IV, St. Vojtech (Adalbert) and Sigmund. “Charles Bridge – ray through centuries” – the picture about the astrological and astronomic relations of the origins of Charles bridge. – The Old Town Hall was established in 1338. The adjacent Gothic Clock Tower dominating the Old Town Square was built in the latter half of the 14th century. – The most valuable part of the Old Town Hall (placed in the lower part of the Clock Tower) is the Orloj – an unparalleled medieval Astronomical Clock the purpose of which was to foretell the coming of the savior. – As the hour approaches (every hour between 9 a.m. and 9 p.m.) people are milling below the the Astronomical Clock for a brief but spooky spectacle taken straight from the Middle Ages involving a skeleton, the 12 apostles, and a fierce looking Turk. – The bottom part of the clock was supplemented with a round calendar including paintings by Josef Manes (1865). 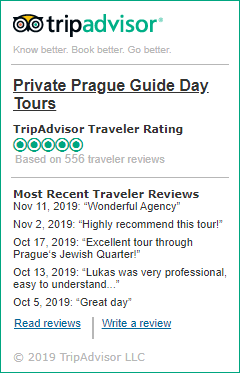 – The Clock Tower provides best views of the Old Town and the Prague Castle and can be accessed through the Information Center and two elevators. – The eastern pseudo-gothic wing of the Town Hall was destroyed by the Nazis at the end of World War II on May 8, 1945, and has not been rebuilt yet. – The oldest preserved synagogue in the Central Europe. – It was built in the early gothic style in the late 13th century and richly adorned by stonework. – Also the inside furnishings (gothic wrought-iron grill, wrought chandeliers) are of ancient origin. – Up till now it has served as a house of prayer and the main synagogue of the Prague Jewish community. – Apart from the Old New Synagogue it is also recommended to visit one of the biggest Jewish museums in the world; it contains valuable Jewish artifacts taken from deported Jews and brought to Prague by the Nazis. For details of the Prague Jewish Museum see the page “Museums and Galleries”. – The only preserved part of the old Gothic fortification system of the Old Town built in 1230´s. – It served as a gunpowder depot in the 18th century. – A monumental entrance to the Old Town built by Matej Rejsek in the gothic style in 1475. – You can also admire the adjacent most beautiful Art Nouveau building in Prague – The Municipal House with the Smetana concert hall. – Tip: take a break and have a coffee in the original Art Nouveau Cafe in the Municipal House. – “The King’s Court” – life in medieval Prague (1st floor). – The history of the city – market place, festivities, fashion, trades, punishments, prison, city seizure, the medieval family (2nd floor). – The history of the Powder Gate – reproductions of historical graphic sheets on loan from the Prague City Archives (3rd floor). – Mobile headphones may be rented in the box office for the exhibitions on the first and second floors with texts in Czech, English, German, French, Italian, Spanish and Russian. The rental fee is included in the ticket price. – One of the most valuable buildings of the “Prague Baroque” period with a dominant dome and the belfry (architects K. Dienzenhofer, K. I. Dienzenhofer, A. Lurago, 1704 – 1756). – The inside decoration of the church is also a specimen of the high baroque style (J. L. Kracker, K. Skreta). – W. A. Mozart played the organ here during his stay in Prague. – An early baroque building by Prague lutherans 1611 – 1613. – 1634 – 1669 rebuilt by the Carmelite Order. – The church is world-famous thanks to the Prague Bambino – Infant Jesus wax figure (of the Spanish origin), which was presented to the church by Polyxena of Lobkowicz (1628). – This unique church offers English masses for the public starting at noon on Sundays. – A Marian pilgrimage place with a copy of the Italian Santa Casa (G. Orsi, 1626 – 1627) including also the baroque Church of the Nativity of Our Lord (K. I. Dienzenhofer, 1734 – 1735). – The ground is encircled by a cloister and chapels. – The spire houses a carillon which consist of 27 Loreta bells which tune a Marian song “We Greet You a Thousand Times” (every hour from 9 a.m. to 6 p.m.). – The most valuable item of the liturgical treasury is the so-called Loreta Treasure, a collection of sacral object from the 16th to 18th centuries. – The most famous of these is the Diamond Monstrance adorned with 6 222 diamonds. – Ancient legends situate the original seat of the Czech princes – the legendary Princess Libuse and the first Przemyslides – on the hill. – In fact, however, this fort had not been founded until the Prague Castle was already in existence, since it dates back to the mid-10th century. – In the latter half of the 11th and in the 12th century Vysehrad used to be the Przemyslides princes’ main residence which brought about a generous building activity within its walls. – and the underground casemates housing the originals of several baroque statues from the Charles Bridge. – The Vysehrad site is open the whole day.